I want me some fried chicken, y’all! This requires patience. I first marinated the chicken overnight in buttermilk, ginger-garlic paste, salt and my spice mixture (combination of kashmiri red chillies, coriander, cumin, fennel, clove, cardamom and cinnamom). The next morning, I mixed the flour, cornflour and a little marinade and coated the drumsticks with it, ensuring the flour was nice and craggy all over. I then deep fried it to get the outside crisp and then baked in in the oven. Once slightly cool, I put it into the fridge for about 2 hours and then fried it again before eating it. I was pretty successful and the chicken was crispy outside and tender inside. Improvements for next time – more masala in the marinade and definitely in the coating. And deep fry it on slightly lower heat, to allow the coating to cook gradually and stay crisp for longer. And of course serve it with the original Kombdi cha rassa or gravy on the side. 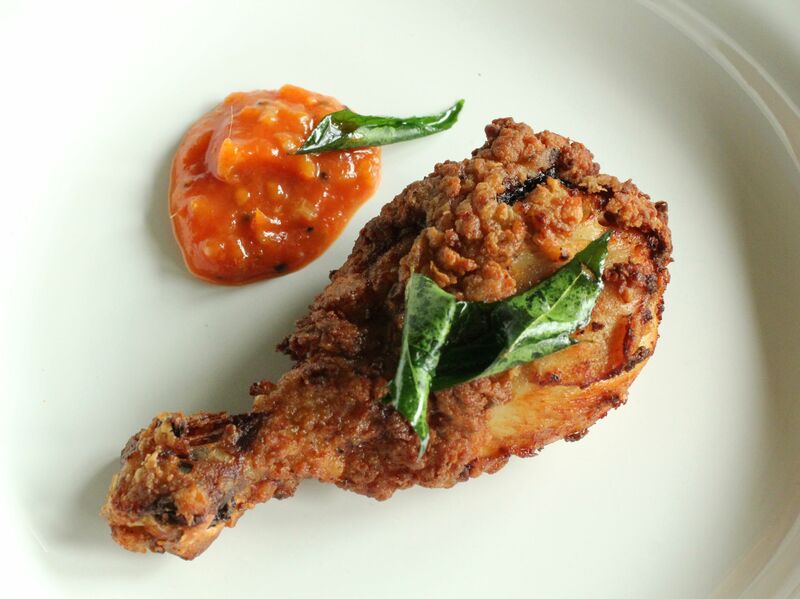 This entry was posted in Marathi cuisine and tagged fried chicken, kombdi cha rassa. Bookmark the permalink.